It’s not a secret that one of my all time favourite guitar instructional books is The Advancing Guitarist by Mick Goodrich. One the exercises explained in this great book is about creating a random sequence of chords by writing every type of chord (major, minor, all the 7th chords and, if you feel more adventurous, chords with extensions and alterations) on small pieces of paper and extracting them at random. 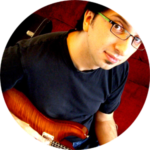 This will not only improve your sight reading in terms of chords and chord progressions, but, if you record these sequences to create a backing track, it will greatly improve your improvisation skills. 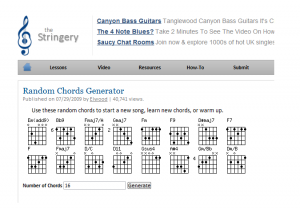 This is where http://www.thestringery.com/featured/random-chords-generator/ comes into play. 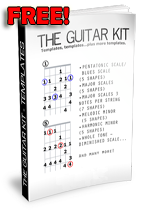 On this site you can easily generate random sequences to improve your chord recognition knowledge and improvisational skill. The default number of chords is 16 but you can easily change that number. I advice to play along to a drum beat or a metronome, so that you are more focused, starting with a chord per bar. Also you could leave the recording backing track for a few days, so you completely forget what you recorded, and use it to practice your aural recognition skills (ear training). Try and see if you can recognise a major chord from a minor, or what extensions are contained in a chord. I am also sure you will find some ‘snippets’ that will inspire you…maybe the beginning of your next masterpiece.